Drew Figdor, whose weekly-dealing Lyxor UCITS fund won The Hedge Fund Journal’s 2014 UCITS Hedge award for ‘Best Performing New Fund,’ after its double digit return in 2013, has been trading merger arbitrage since the 1980s (and on the Lyxor platform since 1999). Seldom has Figdor been so excited about the opportunity set as he is in early 2016. “The market dislocation has increased the opportunity set and we are seeing deal premiums of 60-100%,” he enthuses, and reels off four deals: healthcare heavyweight Abbot bid for Alere at a 60% premium; drug-maker Mylan bid for Sweden’s Meda at 100% over; China’s ZoomLion conglomerate offered a 100% premium for US manufacturer Terex; and Westlake Chemical went hostile in stumping up a 108% bump for Axial. These premiums are quite extraordinary when the historical average takeover premium is in the region of 30%. Cheaper investment grade financing is one driver for the deals as investment grade corporate bond yields are, arguably, tracking the drop in US Treasury yields. Figdor thinks some cyclical stocks became severely oversold. Gargantuan premiums and elevated, often double-digit, spreads are two reasons why Tiedemann is ramping up exposure; the old rule of thumb about merger arbitrage offering 1.5 or 2 times the risk free rate does not seem to make sense now. Tiedemann’s benchmark programme has increased gross long exposure from 55% in August 2015 up to 105% by December 2015. It is one of many liquid strategies that fit easily into a UCITS, and its concentration limits have always been inside the UCITS diversification criteria. Unusually for a UCITS feeder, the Lyxor strategy offers investors a higher level of risk: 1.5 times that of Tiedemann’s merger arbitrage strategy, meaning that it was running gross long exposure around 158% at year end. “The risk reward now is two to three times greater than what it was in August as spreads have widened,” opines Figdor, who also battens down the hatches when he has lower conviction: historically the lowest gross long exposure was 40% in 2002. Though some academics characterise merger arbitrage as being akin to selling put options (and some systematic and quantitative merger arbitrage strategies have performed rather poorly over the past few years) Tiedemann has delivered investors an uncorrelated return profile. “The core strategy has had no down years in 23 years, made money in 2008, and even profited in the fourth quarter of 2008 when the S&P 500 was down more than 20%,” illustrates Figdor. Returns for the Lyxor feeder appear in Fig.1. Figdor has performed well partly due to controlling losses. In 23 years, only eight deals have lost more than the internal limit of 1.5% for the benchmark programme (and only six have lost more than 2.25% for the 1.5 times exposed Lyxor strategy feeder). We explored multiple differentiating factors that may explain why Tiedemann’s approach to the merger arbitrage strategy has historically been associated with far lower equity market correlations than the ‘textbook’ approach – of buying and holding merger deals until they complete or break. The old adage that ‘it is better to travel than arrive’ applies to some deals Tiedemann invests in. Though the strategy avoids ‘rumourtrage’ and sticks to announced deals, it is not exclusively anticipating the ultimate consummation of deals and takes a view on a far wider variety of events along the timeline of corporate transactions. Figdor is focused on 0-30 day merger arbitrage events that involve hard catalysts: as well as the usually binary event of a final deal closing; other events requiring more nuanced interpretation include shareholder votes, regulatory decisions, legal decisions, deadlines for increasing bids, and earnings announcements. So Figdor can trade around some deals for a year or more, so long as there are reasons for volatility around events, and these events are not necessarily correlated with market direction. For instance in early 2016 Figdor adroitly traded the Shell/BG deal. Starting the year with a 1% position size, the strategy maxed out at its cap of 6% ahead of the critical shareholder vote. Recalls Figdor: “As all four proxy solicitation services recommended voting in favour of the deal, and five shareholders publicly said they were for it, we thought the outcome had become more defined and less risky. Just counting the math made failure unlikely, yet the spread with 5-6 days to go was 6-7% gross.” Though equity markets in 2016 had one of their worst Januaries ever, this trade profited. So, Figdor dynamically updates his views on spreads and says “there is not a deal you like or dislike, but a spread you like or dislike.” Every kind of risk has some appropriate price, which also implies that if the spread is too tight the right position may be to go short. Figdor trades merger deals from both sides so his ‘reverse arbitrage’, or shorts, can profit from spread widening – or eventual deal breaks. In 2015, the strategy had reverse positions in Office Depot/Staples, Baker Hughes/Halliburton, and Tokyo Electron/Applied Materials. “Complexity and uncertainty is always good in our world so these deal breaks were positive,” he says. Probably most important at the current juncture, the firm embraces more complex deals that it perceives as offering not only higher (and volatile) spreads but also a less asymmetric risk/return profile. Figdor explains that given average deal premiums of 35%, a ‘plain vanilla’ deal with a 1% absolute spread could have a downside:upside ratio of 35:1, whereas Figdor is looking for complex deals where he estimates a downside:upside ratio of 2:1. Valuation matters because it underpins downside risk, so the scale of premiums being offered in early 2016 could be viewed as indicating that the downside, in general, is less than it might otherwise be – and the potential upside from counter-bidders entering the fray could be greater. Figdor views deal complexity as a pyramid. At the top are the friendly and strategic mergers with narrow spreads, that everyone is happy to hold, including mutual funds and non-merger players. Then “as you go down the inverted pyramid more people are researching the simple deals, fewer are researching and investing in complex deals, spreads are 1-3% gross on friendly and 15-18% on complex, so the opportunity set is 5x friendly deals,” Figdor salivates. Both Figdor and his team find it worthwhile to visit companies, their customers, competitors, suppliers and regulators. In the spirit of Peter Lynch, “we like to ask questions and test theories, visiting companies and regulators,” Figdor says. So in January 2016 alone the team visited four countries and ten cities. One of Figdor’s fondest memories was when EU Competition Commissioner, Mario Monti, blocked the GE Honeywell deal 16 years ago. “This was the most positive event in my 25 years in the businessas it altered the perception of anti-trust risk to being hard to predict. That is where we want it to be, so our research gives us an edge,” reveals Figdor. “Uncertainty, volatility and higher perceptions of risk always create a quantum leap in spreads in a non-linear fashion,” recalls Figdor. For instance, Keurig/Green Mountain was a deal that still offered a spread of 2-3% for antitrust approval risk, even after financing had been secured. Figdor was happy to size up the position ahead of the antitrust decision, and this is another example of taking event risk rather than market risk. Tiedemann will sometimes retain consultants (though not expert networks) to drill deeper into deals. To help gauge antitrust risk on Expedia’s bid for Orbitz, Tiedemann hired an econometrics firm to carry out the type of analysis that government regulators perform, looking at what pricing power the combined entity might have and how its competitors could react. “Our information may not be as good as the government has, but we are taking research to another level,” says Figdor. Tax inversion risks may also be over-estimated by some investors, according to Figdor. “Today the Allergan/Pfizer deal has a $55 dollar spread, which works out at 19% in absolute terms and far more in annualised terms,” points out Figdor. He infers that the deal spread ascribes only a 50% probability of deal completion – but unless the government changes its 60/40 guidance (introduced in 2014 around the time of the Shire deal break), Figdor thinks it has a good chance of closing. Tiedemann generally prefer non-leveraged deals because experience tells them that “financing markets are generally open or closed and not much in between.” But sometimes other market participants may be factoring in too high a probability for the risk of financing failing. Figdor hones in on two types of deal where, in early 2016, Tiedemann’s analysis leads to a high degree of confidence in the security of financing. “Most deal risk depends on investment grade financing where capital is freely available,” he says, and “leveraged LBOs with stapled financing or underwritten commitments” can also be attractive. When we met, the strategy had a position in EMC/ VMware Dell, which at that time had a huge 17.5% gross spread. Overseas or multi-country deals are another example of complexity that is eschewed by some merger arbitrage managers who prefer to stick to a limited number of jurisdictions, sometimes only the US. The Tiedemann strategy is more geographically diverse so it scours the globe in search of deals in overseas equity markets that need not move in tandem with the US. Tiedemann invests across most of the G20, OECD countries and has found the environment improved in some of them. “Japan used to be unpredictable 10-20 years ago due to cross ownership and a legal system that favoured companies, but in the last 5-10 years that dramatically changed,” says Figdor. In South America, the fund has done deals in Brazil and Chile. As well as overseas domestic deals, cross-border deals can have wider spreads as “the company gets lost over continents and there is not much research, while some holders who cannot own overseas stocks may become forced sellers,” he says. Smaller deals, with market caps of $500 million to $1 billion, can also offer better spreads, perhaps for some of the same reasons – there can be less, or sometimes no, sell side coverage. All of this intensive research is made possible partly because Figdor’s teams do not get distracted by operational matters. Figdor enjoys being part of platformsthat provide the infrastructure and support that allows him and his team of 11 (with six analysts and two traders) to focus on research, analysis and trading. Tiedemann is essentially a platform that provides back office, accounting, legal, compliance and marketing services, currently to two strategies. The other one is Stuart Lipmann’s mortgage backed securities strategy, which is run separately from the merger arbitrage strategy. The research process is centralised. Every day each analyst writes up their top five priorities for an 0830 meeting where everyone must stand up and present their ideas. Figdor pulls the trigger and analysts do not trade their own books or names. Lyxor received The Hedge Fund Journal’s 2016 award for ‘The Leading UCITS Hedge Fund Platform’. This publication has profiled the overall Lyxor platform in detail before, so on this occasion just got a brief update on the UCITS part. Daniele Spada, Head of the Lyxor MAP explained: “We offer all services around UCITS funds including market risk, liquidity and risk management.” He added: ”We look for managers like Tiedemann that can be structured into a UCITS format without losing the skills of the manager,” though Tiedemann is relatively unusual in Lyxor offering both UCITS and offshore feeders into the same strategy. 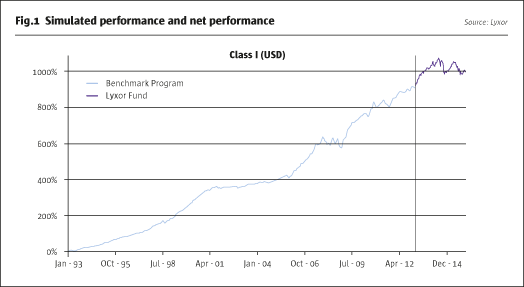 Launching their first UCITS in 2013, Lyxor were not the first movers on UCITS, though. “We prefer quality over quantity and would rather have 10-15 UCITS funds than 30 names,” said Head of Hedge Fund Selection, Kunjal Shah, who belongs to a team of 30 fund researchers covering mutual fund and hedge fund strategies. Daniele Spada adds: “We want to be an investment platform rather than a distribution platform, by which we focus on selecting a fair number of the highest-quality managers running assets in strategies relevant for investors in today’s environment.” The UCITS platform is gathering momentum in terms of assets, with $500 million of inflows in 2015 taking total assets to $2 billion. Lyxor has no need to find another merger arbitrage fund, but within some other strategies might have two or three managers of different sizes or pursuing different styles. “One could be the core manager, another the satellite and another an emerging niche manager,” explains Shah. Lyxor has a clear roadmap for adding three or four new managers this year, with a US equity long/short manager already signed and a second one coming soon. Shah hears “investors want less directional and more market neutral managers, including relative value, fixed income arbitrage and global macro.” The first port of call can be with existing managers to see if they want to convert their offshore structures to a UCITS, but new managers can also be onboarded. There is no pressure to squeeze any strategy into a UCITS as Lyxor offers an a la carte menu of fund structures. Lyxor’s Ireland-domiciled UCITS platform complements its Luxembourg-domiciled AIFMD platform and its Jersey-domiciled offshore structures.